We are definitely not fashionistas who even have time to stare longingly in the mirror all day. 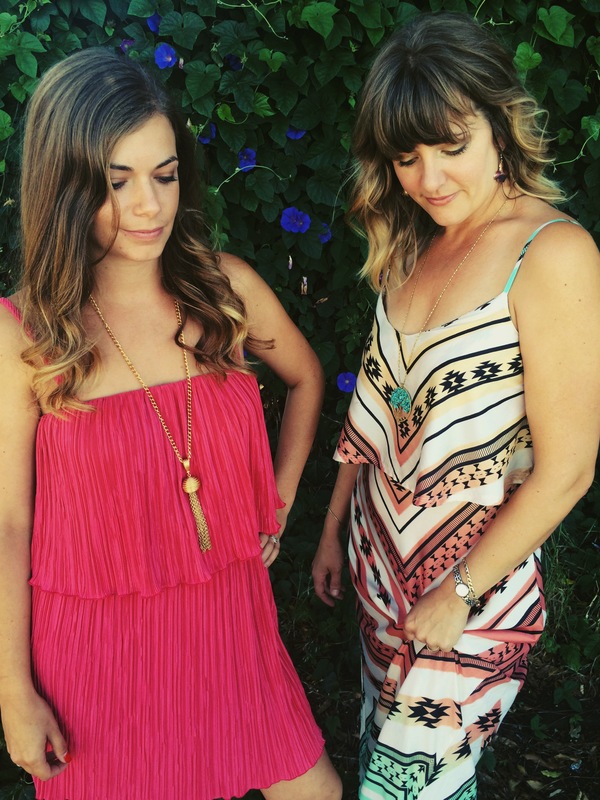 However, when Katy from Curio in downtown San Luis Obispo asked us to come and play dress up…we could not resist!! 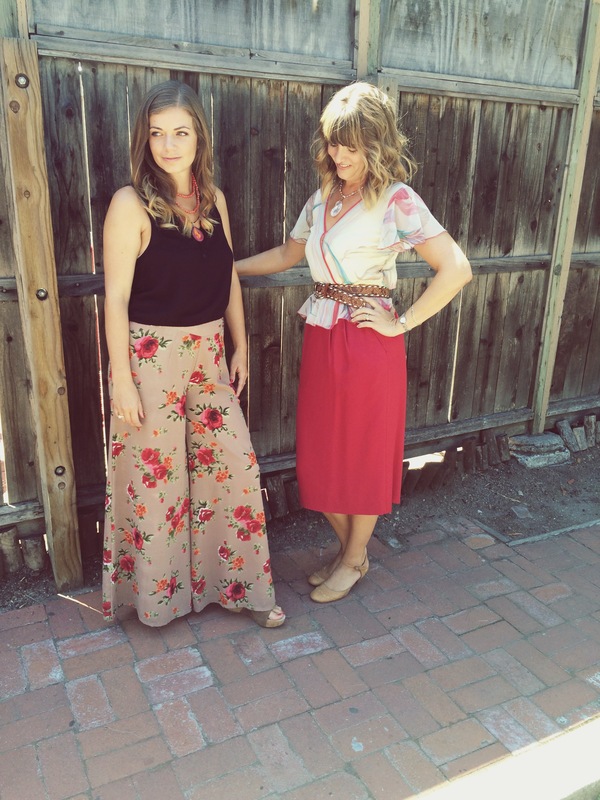 It is a shop that literally encompasses all that we love– fabulous finds and thrifty pricing. Sam and I have been shopping at thrift stores for years, but Curio feels like a treat. They curate such a gorgeous selection of gently worn fashions, that you instantly feel like you are in a high-end boutique. Here comes the “horn tooting”: check out all the lovely finds below and the sweet words that Curio strung together about us. Phew, not too bad. Right? Every once in a while, you come across a business that you just love. I mean, not just for what they do, but for the people who run it. This is the case with the girls of Zest It Up, an event design and catering company (and super cool DIY fun blog), who are rocking the wedding industry. Let me explain. Chanda and Sam are the ghostbusters of wedding planning. Boring wedding food? Who you gonna call? Zest It Up. They’re the classy meets food truck and all around zesty wedding planners who are guaranteed to bring life, energy, and, well to put it succinctly, ZEST into an event. I think the thing that also makes me love them is their amazing friendship and chemistry when they’re together. You can really tell that they truly LOVE what they do and very much enjoy doing it together. They’re also super duper cute, which makes them absolutely perfect for a photo shoot! Let’s talk about their style. Chanda and Sam do a lot of dressing up on a daily basis. They meet clients and go to rehearsals and weddings all the time, so not only do they need to look great, they need to feel great in their clothes so they can move around and actually work in their pretty dresses. Since they both have such great style, we decided to go with a lot of really beautiful clothes that they could still function in and didn’t feel stuffy. Ok look how cute they are together! 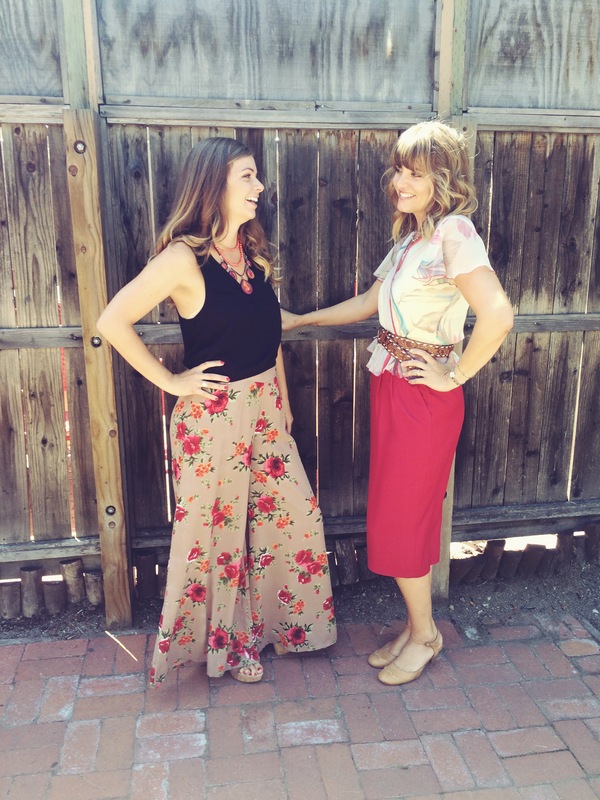 Sam (on the left) is wearing these gorgeous flowy floral palazzo pants with wedges to give her a little extra height (those pants are long!!) and a really nice black tank. We added some bright jewelry to pick up the colors in the pants…keeping the outfit young and making it a little more fun. I love how her outfit is a nice contrast, yet still compliments Chanda’s (on the right). We went with a vintage feel for Chanda, with a really classy pencil skirt and peplum top. The vintage leather belt and abalone necklace again keep the outfit young and add interest to it. We used these cute little kitten heeled Mary Jane’s in keeping with the vintage vibe. Cowboy boots would be great with it too! These outfits would be awesome for an outdoor, barn kind of event where they can feel casual but look lovely at the same time. How fun is this pattern mixing between the two of them?!? Sam (left) is wearing a floral cotton dress that on it’s own, would be pretty casual. So we put a long sleeved lace sheer top over it and added wedges and a long statement necklace. Now instead of looking like a casual Friday, she looks like she’s all dolled up and ready to go! Layering is a spectacular tool to change casual items into fancy ones! I love this menswear kind of look on Chanda. The grey velvet jacket takes this chevron mini to a totally new place. The ballet lace up espadrilles and layered beaded necklace really grab the colors of the dress and make them pop. Again, it’s the layers and details that take a relatively casual dress and make it event-ready. Also something to note…if you have a really bright and bold pattern like this chevron pattern, putting a jacked or a top over it minimizes the AMOUNT of that pattern, making it often feel more wearable. Ready to go dancing! 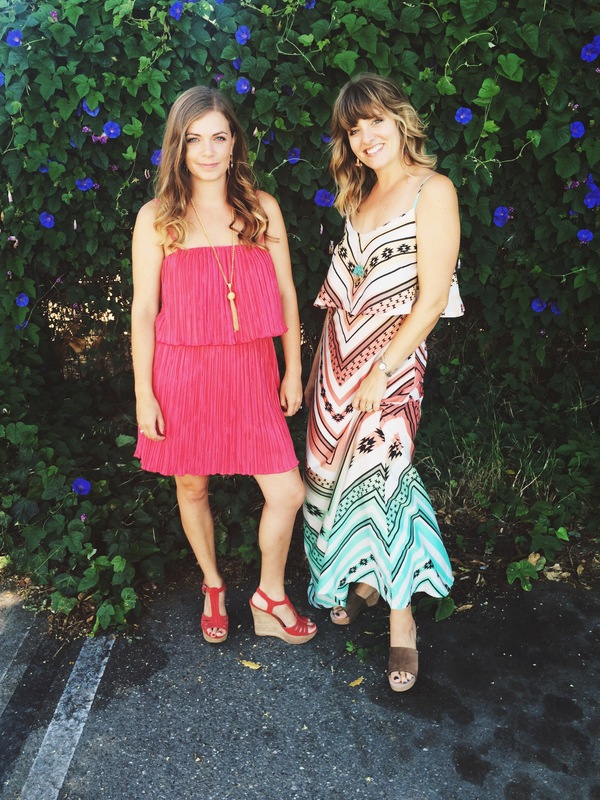 I love these looks on these Zesty girls! I mean look how beautiful they are?? Sam is wearing this amazing kind of 1970’s inspired layered dress (it totally reminds me of Halston Heritage) with the coral wedges and gold jewelry. She can really move in this dress, whether she’s cutting it loose on the dance floor or running around making an event go smoothly. Chanda looks stunning in this silky aztec maxi and turquoise jewelry. Again, she could easily look like she’s going to the party even though she’s running the show! This last look is a little more casual, a little more day-to-day taking meetings and hanging out. I love this light orangey lace dress on Sam. We layered it over a vintage slip and let the lace at the bottom peek out. The flannel and boots dress down the lace, making it a more daytime look. Chanda is wearing a similar peachy orange halter with this vintage black skirt that has kind of a cut out lace pattern on it. The denim jacket and boots again, dress down the outfit and make it more appropriate for coffee shop meetings and daytime events. I don’t know if friendship gets much better than this. 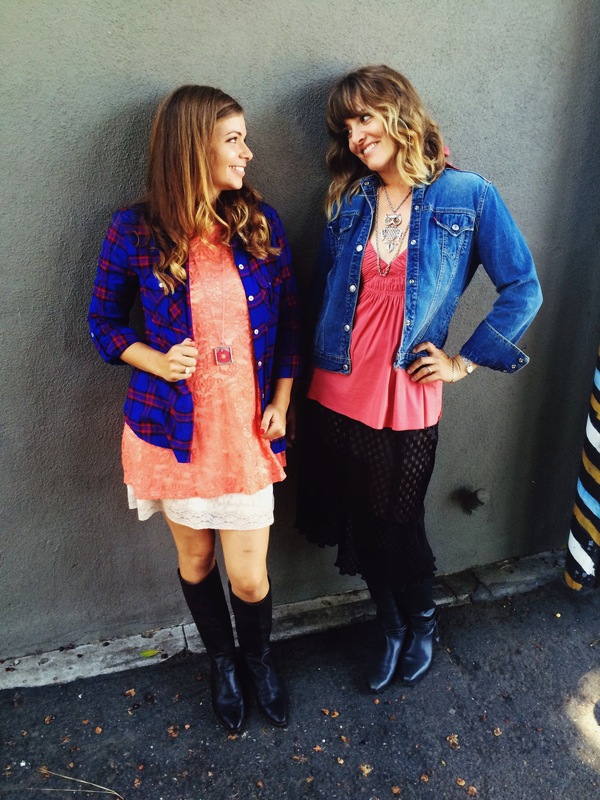 Two girls having a blast, wearing fun clothes, and event planning…I think they’re living the dream! And it’s a zesty one at that! Need help with layering? We LOVE this stuff! As the seasons change from summer to fall, let us help you figure out how to layer and take your summer pieces into fall without missing a beat. Come on in!